The Notorious Mr. 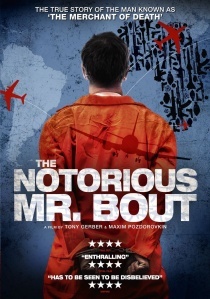 Bout, released on DVD by Kaleidoscope Home Entertainment on 6th October 2014, is the story of Viktor Bout, a Russian entrepreneur, a war profiteer, an aviation magnate, an arms smuggler and amateur filmmaker. The Notorious Mr. Bout, released on DVD by Kaleidoscope Home Entertainment on 6th October 2014, is the fascinating story that follows Viktor Bout, a Russian entrepreneur, a war profiteer, an aviation magnate, an arms smuggler and, strangest of all, an amateur filmmaker. Until three days prior to his 2008 arrest on charges of conspiring to kill Americans, Bout kept the camera running, documenting a life spent in the grey areas of international law. Dubbed 'The Merchant of Death' and portrayed by Nicolas Cage in Hollywood's Lord of War, Viktor Bout can justifiably be called the world's most famous arms dealer. With unprecedented access to Bout's home movies and DEA surveillance material gathered during the sting operation to bring him down, The Notorious Mr. Bout is a portrait of a life much mythologised but little understood. With a special edition featuring - for the first time on DVD & Blu-Ray - both the original, and the alternative Radio 1 soundtrack curated by Zane Lowe, plus exclusive post cards featuring original artwork, Drive is released 13th May 2019 from Kaleidoscope Home Entertainment. Welcome to the private, and extremely weird, world of Jeremy and Mark as seen through their eyes.